I’ve got it; the ultimate throw down: Alien vs. Predator against the most fearsome foe of all—-Strawberry Shortcake! My thoughts... I think this needs to look much different than anything associated with the print publications. We want to make it clear this isn't something that is actually printed and sold, but instead a collaboration with forum members on a project. So with that said, if we put Digital Webbing on it, it needs to include the word "forum" with it. Also, let's keep the spider logo off of it as well. Less confusion, the better. The reading public out there does get confused on unexpected things; for example, there were countless times readers thought the name of the publishing company was "Digital Webbing Presents" instead of "Press" because I put the title up on the comic's top bar. Hellboy AFTER Monster Mash would be best so it doesn't cause confusion on whether it's a Hellboy comic but instead a forum collaboration featuring Hellboy, if that makes sense. anyone can do anything...multiple options are great. and we can all decide which way will be best. just remember everyone...we are waiting on cover ART as well. By members of the Digital Webbing Forums. Here is a cover idea based on Scribbly's wording - for condideration. I’m wondering if we shouldn’t use the official HB logo. I’d bet Mignola has that trademarked. Definitely trademarked. And it makes it look too legitimate. Since it isn't..... would be safer to remove. yeah...so...anyone want to/able to design a NEW hellboy logo of some type? 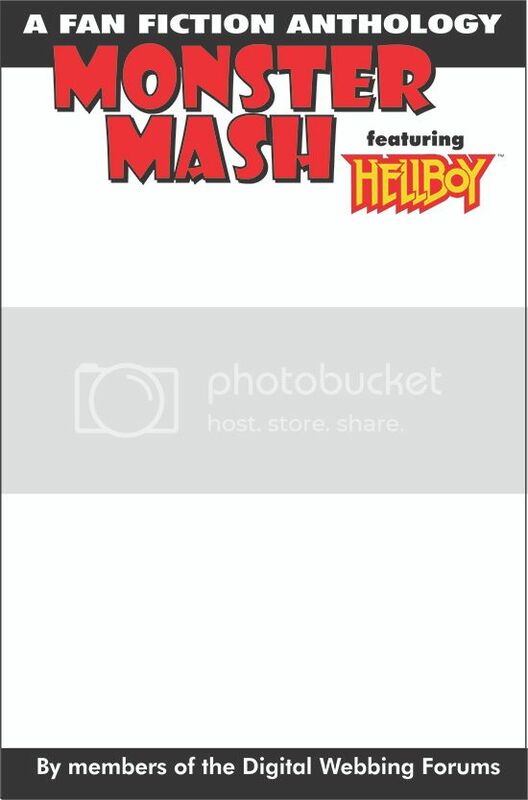 I think if we just get rid of the "TM" next to Hellboy logo we should be fine; that'd make it clear it isn't our trademark and the "Fanfiction Anthology" part clarifies that it is an unofficial creation. Throw that edit in and IMO Robert's new version works.